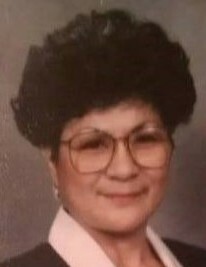 Obituary for Vaisa T. Honeck | Jones Funeral Home, Inc.
Vaisa Honeck, age 73 of Crossett, AR, passed away at her residence on March 17, 2018. She was born in American Samoa on October 16,1944 to her parents Togia Seu Asaeli and Ioana Si'omia Samia. She was pre-deceased by her parents, her daughter Teresa Runion Meeks, two brothers and one sister. She is survived by three sons, Troy Runion of Crossett, AR, Patrick Runion of Mt. Pleasant, TX and Neil Honeck, Jr. of Ruston, LA; as well as several brothers and sisters: Lorraine (Liua) Leiato, Madeline Warrick, Joanne (Tia) Everett, Seu Asaeli, Emelia Crispin (Fula), Eleanor Asaeli, Mapu Asaeli, Liua Fatuesi, Matalena Chisolm, and Richard (Bronco) Togia; two grandsons, Brock Rice and Taylor Meeks and two great grandchildren, Piper and Ryder Rice and a host of other family members, loved ones and friends including Zoe and Allie Meeks who held a special place in her heart. Ms. Honeck was very faithful to her church, Mt. Olive Baptist in North Crossett. She loved spending time in the yard as well as spending time with her family and friends. She also loved children, dancing and attending school functions and church gathering. Funeral services will be at 10:00AM on Saturday, March 24th at Jones Funeral Chapel in Crossett with Pastor Eric Hodge officiating. Interment will be in Egypt Cemetery in Hamburg, AR. Visitation will be Saturday, March 24th at 9:00AM at the Jones Funeral Chapel. In lieu of flowers, the family requests donations be made in her honor to Hospice Home Care of Monticello or to Mt. Olive Baptist Church in Crossett, AR. Pallbearers will be Troy Runion, Patrick Runion, Neil Honeck, Jr., Brock Rice and Taylor Meeks.